Revolutionary formula that leverages the benefits of nanotechnology for the ultimate antioxidant effect. The proprietary nanoSOF nanomaterial enables the transport of essential ingredients to the cellular level, highly increasing the absorption of nutrients and antioxidants. Antioxidants are vital to the body because they interact and neutralize free radicals that are produced through oxidation, known to damage cells. When the body cells are exposed to oxygen throughout the day, they experience oxidization. Once oxidation occurs, the chemicals in the body become altered and become free radicals. Because environmental factors are also a constant variable, exposure to alcohol, pollution, and cigarette smoke are also potential causes for the production of free radicals. Although the body naturally produces free radicals and releases them into the bloodstream, there are not nearly enough naturally occurring antioxidants to adequately prevent the damage that they can cause. Free radicals are responsible for damaging cells after affecting proteins, lipids, and DNA that are all likely to trigger a variety of diseases including hypertension, cancer, diabetes, Alzheimer’s, heart disease, Parkinson’s, and speed up the aging process. In order to have more antioxidants than free radicals, the body needs to ensure that there is a regular supply of external antioxidants administered to the body. As antioxidants are supplied the body, balance is maintained between the number of free radicals and antioxidants as the body neutralizes and removes the free radicals that are found in the bloodstream. There are a variety of antioxidants that can be found in nature. Because of the variation, there are a number of benefits for different parts of the body. Certain strains are beneficial for eye health, while other types specifically help to maintain healthy heart function. Antioxidants are known to help protect the skin from UV damage and premature aging, support the immune system by protecting cell function, improve cognitive function, balance mood-related hormones, and reduce the risk of injury or illness. 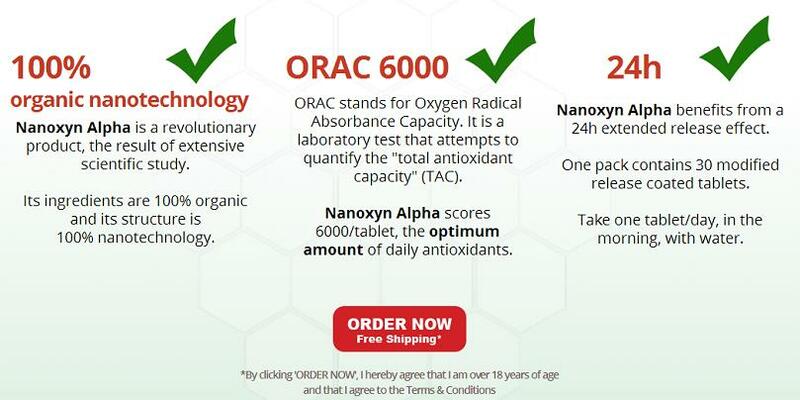 Nanoxyn Alpha is a 100% natural, antioxidant supplement that uses a unique proprietary nanotechnology to deliver oxygen to the cellular levels of the body. By neutralizing the activities of free radical activity in the body, Nanoxyn Alpha uses a unique blend of ingredients supported by scientific research and data to provide antioxidants to the bloodstream. Based on years of extensive medical research, this supplement is the only one on the market that provides antioxidants to the body through the most direct path. Made with a propriety formula that uses Charcoal Carbon, Nanoxyn Alpha ensures that all the necessary ingredients reach the cellular level, increasing the level of absorption of the antioxidants and nutrients. Nanoxyn Alpha is the first affordable dietary supplement that is based on nanotechnology, which is unique as it is the only proprietary formula that is based on NanoCarbon – delivering oxygen directly to the bloodstream. Because of the unique formula, the supplement contains high levels of oxygen that are extracted and converted directly from natural dried olive pits. The porous structure, which resembles foam, absorbs, bonds, neutralizes, and removes free radicals and improves the capability of the natural antioxidants it combines as well. 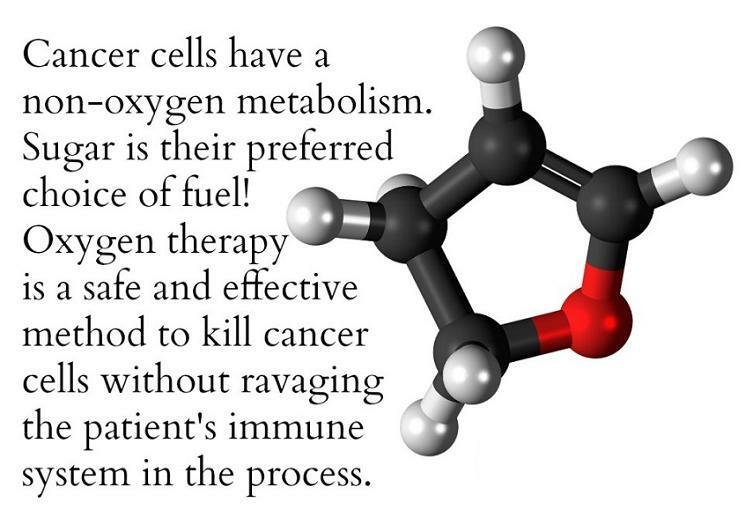 By providing oxygen at the cellular level, Nanoxyn Alpha provides better organ function throughout the body. It protects the heart by providing higher levels of functioning and greater capacity to endure physical stress, strengthening the blood flow. 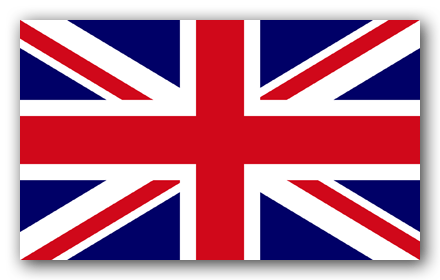 It supports cognitive functions by making the brain work faster and more effectively for cortical processes and higher neuro-psychic tones. Nanoxyn Alpha also supports the liver by providing better absorption of nutrients and increased cellular regeneration. Finally, the supplement improves skin help by countering the effects of aging and improving the condition of the skin tissues and dermis layers. Although each user will experience different results while using the Nanoxyn Alpha, the results remain the same – providing antioxidants to the body. What makes all these benefits so amazing is that they come through the use of one simple supplement, one that is able to completely transform the lives of those who use it. With Nanoxyn Alpha, users will finally be able to get the health support they need to truly thrive. Made with a revolutionary formula, Nanoxyn Alpha counters free radicals by providing individuals with a supplement full of vitamin rich ingredients that are natural, safe, and effective. Below is a list of the active ingredients found in Nanoxyn Alpha, as well as a brief description of each ingredient. Olive Leaves Extract: Used in a number of supplements, olive leaf extract contains Oleuropein, a phytochemical that contains a strong antioxidant that prevents and minimizes the damage done by free radicals. This ingredient also contains antiviral, anti-inflammatory, antimicrobial, and anti-cancer properties. 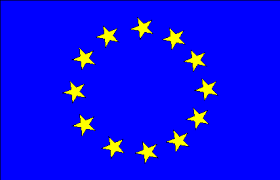 Oleuropein also provides protection against the induced toxic effects of Parkinson’s disease. Red Wine Extract: This ingredient contains polyphenols and phenolic compounds that contain essential antioxidants. The antioxidant found in red wine extract, resveratrol, helps to eliminate the potential risk of heart disease by boosting levels of high-density lipoprotein (HDL) cholesterol and protecting against damage to the arteries. Red wine extract also contains antioxidants that are responsible for damaging free radicals that cause aging and diseases related to the aging process. Grape Seed Extract: Containing powerful antioxidant properties, grape seed extract has shown to significantly increase the blood levels of antioxidants. 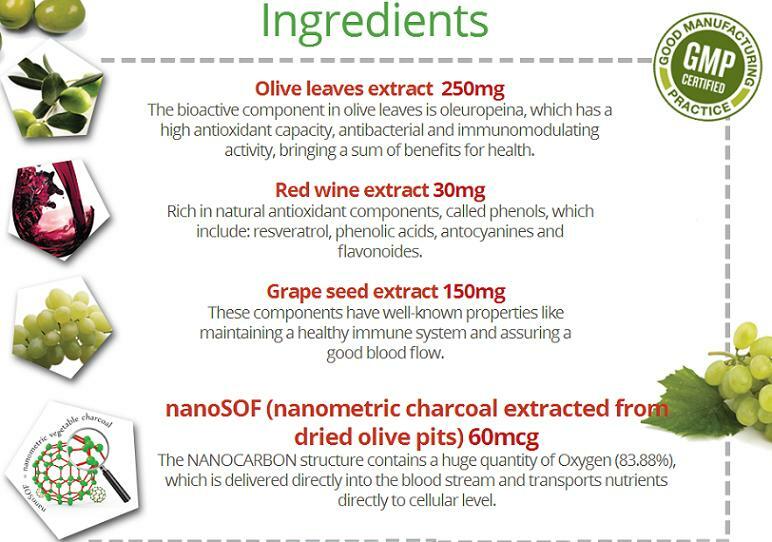 NanoSOF (Nanometric Vegetable Charcoal from Olive Pits): This ingredient, arguably the most important, is responsible for enabling the transport of essential ingredients to the cellular level, increasing absorbility and eliminating oxidative stress by delivering the specific amount of oxygen to each individual cell.